When Shinzo Abe resigned as prime minister 11 years ago it came out of nowhere, two days after a major policy speech. Now, Tokyo is wondering if he’ll shock the government again. Abe’s future has come under intense speculation amid a drip-feed of scandals that have prompted a series of public apologies and driven his poll numbers to near record lows. Critics within his Liberal Democratic Party are going public ahead of a scheduled vote on the party leadership in September, while his former mentor, ex-Prime Minister Junichiro Koizumi, predicted in an interview with the Shukan Asahi magazine that Abe would step down in June. The prime minister’s travails just six months after leading the LDP to a landslide win are casting doubt on a policy agenda that has over the past five years bolstered Japan’s military and attracted investors with a weaker yen. While LDP would be expected to fend off any election challenge by an opposition that has struggled to unite, Abe’s departure could prompt policy confusion as potential contenders in his own party horse-trade for support. A weakened Abe heads to Donald Trump’s Mar-a-Lago estate in Florida on Tuesday to discuss the U.S. president’s surprise decisions to meet North Korean leader Kim Jong Un and levy tariffs on Japanese steel and aluminum exports. While the visit could provide welcome distraction from the scandals, it may be harder than before to persuade the public that Abe’s charm offensive with Trump is paying off. The yen gained against the dollar Monday, after some 50,000 anti-Abe protesters rallied on the weekend outside the Diet and new polls showed Abe’s support levels approaching lows that have led past prime ministers to resign. Abe’s popularity fell to a record low of 26.7 percent in a Nippon News Network survey published Sunday. 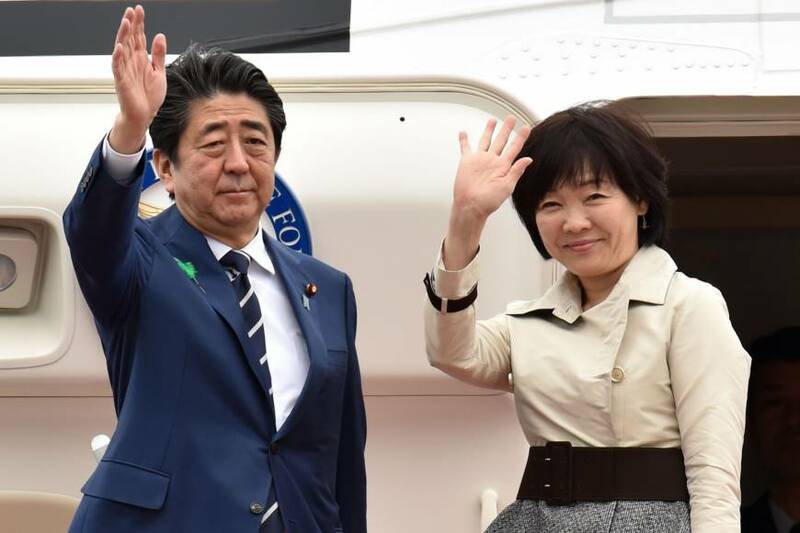 The decline follows revelations that Finance Ministry officials removed the names of Abe and his wife, Akie Abe, from documents related to a discounted land sale. Last week, Abe appeared twice at the Diet to answer for different controversies: denying involvement in a government land grant involving a close friend and apologizing for the military’s apparent cover-up of its reports on deployments in Iraq. 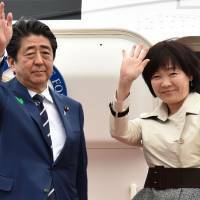 While Abe told the Diet he would stay in his job and work to restore public trust in the government, the past few weeks have presented the prime minister’s biggest political challenge since he stepped down amid a similar public relations maelstrom in September 2007, citing a chronic digestive ailment. Since leading the LDP back to power in 2012 he has shown remarkable resilience, channeling public concerns over North Korea’s missile launches last year to rally back from weakening poll numbers. Building up the Self-Defense Forces has been a key plank of Abe’s agenda, including his long-held ambition to amend the pacifist Constitution. Abe has also implemented a monetary-easing effort that bolstered exporters and lifted stock prices — a program his LDP rivals have suggested needs to end. But economists say his regulatory reforms have fallen short of expectations. He has faced criticism from Trump, and seemingly been left out of the loop lately on North Korea. Abe’s repeated meetings with Russian President Vladimir Putin have failed to bring him any closer to his goal of regaining disputed islands. A poll published by the Asahi daily Monday found that former Defense Minister Shigeru Ishiba was the most popular candidate for LDP leader, with 27 percent of respondents picking him, compared with 22 percent for Abe.